This month highlighting the Casefiles series with a guest review of Casefile 30 The Deadliest Dare and a Casefiles quiz. Plus new collectibles discoveries, letters and more! 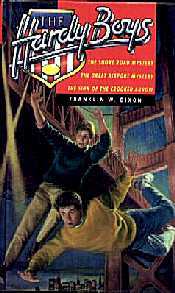 In a recently concluded poll I conducted for subcribers to my Onelist.com mailing list, The Mystery Of Cabin Island was by far the most popular Hardy Boys story. The South Jersey Series Collectors' annual convention will once again be held in Sea Bright NJ on Saturday April 8. In addition to many series book dealers, there will be exhibits and guest speakers. I've received several letters asking if there are any Hardy Boys books available on audio tape. I have a copy and it's pretty good although unintentionally funny at times. Karen Plunkett-Powell, author of The Nancy Drew Scrapbook and contributer to Bayport Times, recently had her latest book, Remembering Woolworths, published by St. Martin's. A nostalgic, in-depth look at the late lamented Five & Dime, it received a glowing review in the prestigious NY Times Book Review. Yep, that's what I'll be doing if you buy some of the many of the books and collectibles listed on my SALES PAGE. If you have not done so already, you'll have to register with the provider of this service, ONELIST.COM. 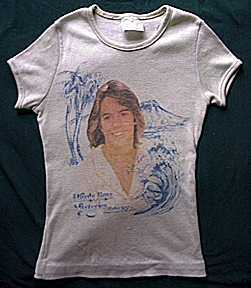 Shaun Cassidy T-Shirt - Similar to other Shaun/Hardy clothing and probably distributed by Sears. 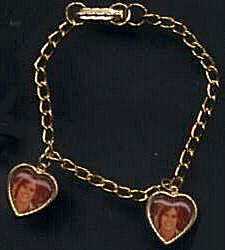 Shaun Cassidy Charm Bracelet - This variant has heart-shaped rather than oval charms. 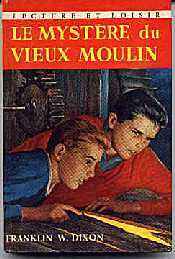 Nancy Drew/Hardy Boys French Edition - Published by Hachette, what title this is is unclear. 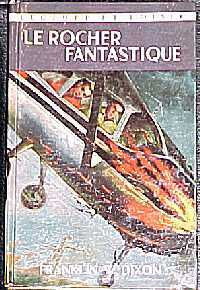 Hardy Boys Iron On Transfer - From the 70's series. Metal Parking Sign - Probably created for the Hardy Boys wrestling tag team. 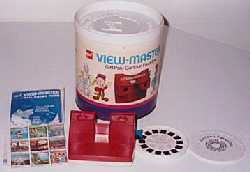 View-Master Set - Containing the scarce Hardy Boys preview reel. My problem with the Casefiles (and make no mistake, I'm glad they were written, if only to extend the lives of our favorite detectives), is their glaring lack of plausibility. What's the deal with the Iola clones? Would an operative like the Gray Man really let two high school students in on America's secrets? 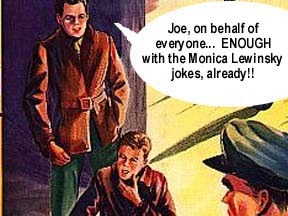 How many times can you get shot at with an automatic weapon without getting hit, and why haven't Frank and Joe shared that secret with the US military? That's why I like Deadliest Dare – it has the right scope. It's still a Casefile, in that it attempts to nail down the teenage vernacular (while in fact missing the cool slang by at least a few years). And it's action-packed and kind of glitzy, like Casefiles always are. It differs from the usual Casefile, though, in that it takes place in our very own Bayport and deals with a treacherous ring of . . . high school kids. The story begins with sabotage at a local dance club, where Frank and Callie are on a date. In a refreshing slap at stereotype, Joe foregoes the party scene and stays home filing papers for his dad. As Frank and Callie stumble out of the club with the other victims of a sneezing powder prank, we begin to suspect that innocent Bayport is playing host to some mischief-makers. And why does Biff Hooper's name keep coming up? After a scary car accident, an anonymous member of the mysterious "Circle" solicits Frank and Joe's assistance and alerts them to the next prank. As usual, the Hardys are not charged with a crime, although they are caught by the police at the scene of one. They split up to follow clues left for their eyes only. Frank researches a rare scrap of paper, braves a ferocious – well, you'll have to read the story – and almost gets shot. Joe traces the origin of a silk scarf. Here, true to form, he gets entangled with a damsel in distress, although he's not portrayed as girl-crazy, which many Joe fans will appreciate. Later that night, when Joe doesn't return, Frank suspects his brother has become a victim of the Circle. But would their fellow classmates really kidnap Joe? Is someone else involved? Frank suspect that something bigger is going down. 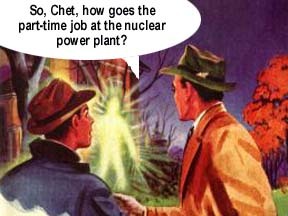 His theory is validated when Joe reappears with new information. And when the Hardys nail the solution, there's plenty of excitement for the most Casefile-happy Hardy fan – cultist kidnappers, hostage-taking, a high-speed chase, and an international killer (without which no Casefile would be complete). It all comes together on Barmet Bay in fairly logical sequence. The dialogue is good, the plot works, and I think Frank and Joe are written in a manner reminiscent of the bad old dustjacket days. They're kids – drinking hot cocoa, eating too many donuts, telling an engaging fib to gain some information. But they're also heroes – rescuing a beautiful girl, risking their lives to aid a friend, fearlessly tracking a killer. For my money, the best scene is the one in which Jeanne tearfully confesses to her prankster past, and Joe accuses her of expecting the Hardys to bail her out. Well, of course, Joe, who else would she call? Call this story a Casefile that remembers its origins; it's a good rainy-day read. New copies of The Deadliest Daremay still be available from AMAZON.COM. Casefiles fans know that the Boys travel far and wide in their efforts to track down criminals and bring terrorists to justice. Can you match the location to the story? 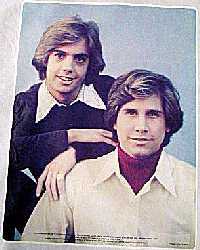 Thanks for your fantastic Hardy Boys' page... it is wonderful, and so thorough. I wonder if you knew that the current edition of The Tower Treasure has a typo? On page 108 (113 of the 3-book compilation) Biff Hooper is referred to as Bill Hooper. I wonder whether this typo has been travelling from edition to edition, since it is technically not a spelling error, or whether it was introduced recently. I enjoy your Hardys website very much and have posted a few messages on your Bayport Connection board. Sorry I cannot help you with some of the requested cover scans but what you have up is very interesting. I have great admiration for your research in the subject because it answers questions that while not earth shattering are fun to know and Lord knows in our crazy world we need a little wholesome fun and info to make our days a little happier. THE GREATEST HARDY BOYS SALE OF THE MILLENNIUM! Mint Condition! Still sealed on original card! Contains Gold Doubloons & Pieces Of Eight from the 1st Mickey Mouse Club Hardy Boys serial. Insurance Additional On All Items.